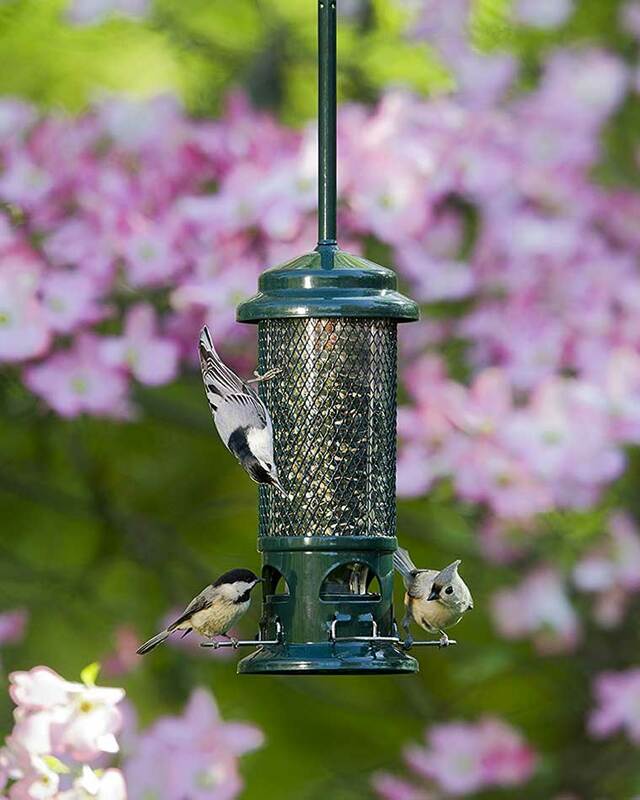 A panoramic anti squirrel bird feeder allows for multiple birds to feed at a time. We love this feeder because when a heavier animal like a squirrel climbs on it the weight will cause the seed ports to automatically close, making it totally squirrel proof. It is also a good way to prevent larger birds from stealing all the seed. Along with having the locking seed ports this feeder has a lot of other great features like being chew proof, waterproof, rustproof, UV stabilized, and a patented ventilation system that allows moisture to get out of the feeder. This ventilation system allows seeds to stay fresh longer and prevents mold from building up inside the feeder after it rains. You can adjust the weight of mechanism that closes the seed ports so you can set it to only allow a certain size bird from accessing the feeder, so if you’re targeting a certain species of bird like finch or cardinal this is a great feeder. The feeder is about 5 inches wide and 21.5 inches tall. There are 4 perches, so birds can access the food from all sides. It holds up to 1.3 pounds of seed, so you won’t have to worry about constantly having to refill it. Whether you’re buying this for yourself or as a gift it will be a home run. Everyone enjoys seeing beautiful birds close to their home. This feeder has great feeders and also prevents squirrels from stealing the seed. 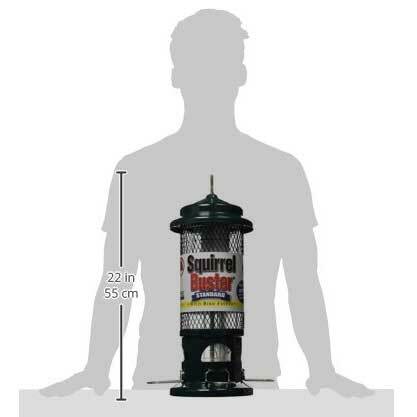 The feeder also comes with the hanger, so you can hang it from a hook on your house, a tree, or other area. If you have any questions or know of any other good feeders let us know in the comments.